You may go for a plastic manufacturing business in Bangladesh if you’re interested to start a small-scale business. As plastic items are used on daily basis in our life, it does not doubt a great concept and profitable as well. Without plastic items, it’ll be impossible to find a single house in the world. Also, it’s not possible to live a single day without plastic items and it’s a part and parcel of our life. It means that there is a great chance for the plastic items business. Moreover, the plastic industry has experienced a remarkable growth in recent times. While investing a small amount in the plastic product making a machine, you can manufacture a variety of household items at your home. Thus if you start a plastic product manufacturing business, you have a great opportunity to earn a good revenue. If you look at the marketplace, you’ll find thousands of small-scale business ideas over there. But, after considering many of the facts, you need to take the decision. You need to find out the different pros and cons of the business before choosing this business idea. It’s known that Bangladesh is a highly populated country in the world with more than 160 million people. It means that any business is perfect for this country. If we talk about a plastic manufacturing business, it’ll go the best. This is because of the huge demand for plastic items for different purposes in our daily life. Just you need thorough researches to find out who are the prospective buyers, present market demand and obviously about your competitors who are already existed in the market. 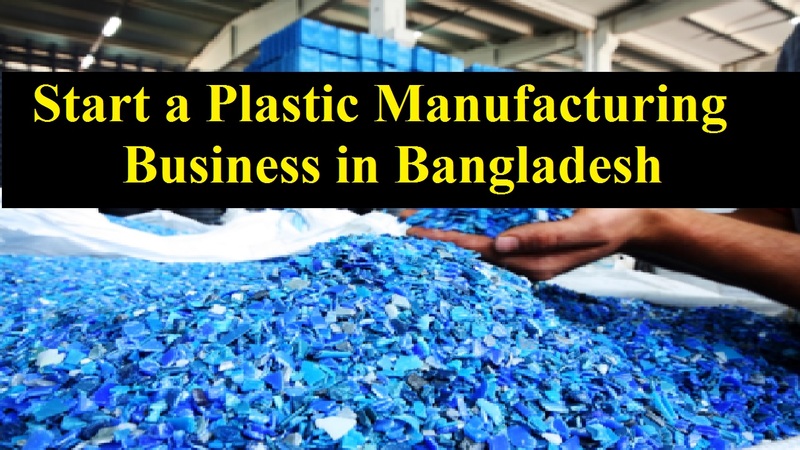 Not only thorough researches but there are many more factors relate while starting a plastic manufacturing business in Bangladesh. From a business plan to marketing, there are many steps to follow if you want to be successful in your business. The reason is that there are already a lot of manufacturers in the plastic industry and you have to struggle with them as a newcomer. But, as nothing is impossible, you can do it as well with some right steps. Now, let’s know the steps that essential to start a plastic product manufacturing business. In the success of any business, a well-crafted business plan plays a vital role. In order to run a business smoothly, a business plan contains the production plan, pricing structure, overall marketing strategy and also the promotion strategy. Also, there will be some other things like the steps for manufacturing small plastic products in a profitable way. That’s why an elaborate plan of how you will transport the plastics from clients to the manufacturing plant is important. Moreover, it’s essential to finalize a plan for the type of injection molded plastic product your business will sell. Although it looks like a hard job to make a business plan, bypassing it may cause failure of your business. As the market is full of thousands of plastic items, you can’t produce all of them. As a result, selecting a particular item for production is much essential for a plastic manufacturing business. In this case, you’ll get great aid from your market research. So, find out the demand of your local market so that you can select the niche. Not only you have to select the type of plastic material you are going to use but find out a reliable supplier of the material as well. Besides, before beginning main production runs, making these early samples will help staff become accustomed to the machinery in a low-stress situation and work out any problems. And if you want to serve prototypes for marketing presentations to potential distributors then the samples will help. For starting up the plastic manufacturing business, determine how much investment capital is available and how much is needed. Because it’ll directly affect the size of the facility available along with how large of an injection molding machine your business can afford. Although a small scale business will need a maximum of US$1000 (BDT0.1 million) of investment, it may need capital up to US$ 8, 000 (BDT 0.65 million) for a big unit. You can easily get financial assistance from banks by submitting a well-crafted business plan for the new government policies. Also, without the necessary resources, you can’t set up your plastic product manufacturing business. And in order to use for leasing the business location, buying the equipment needed to run your recycling business at the initial stages before the business becomes self-sustaining you need to identify potential sources of money. You should not let a single table unturned to market your business as you’ll be new in the market. It’s vital to make aware of your every potential client through your marketing strategies. That’s why you must promote your business when you have everything in place and your business has begun operations. For example, building a website, creating brochures or through other marketing collateral are can be some of the ways to promote your business. If you want to secure a contract with the best company competing for the contract then contact bulk plastic suppliers. You should look at the track record of each supplier company so that you can get the best one. If the company is unable to keep up with the raw material volume requirements of your business then a low bid won’t do any good.